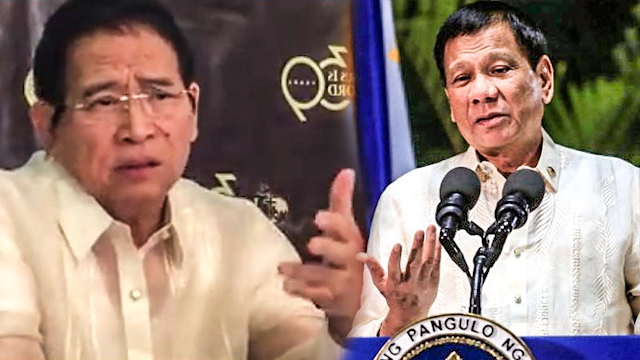 Following his demand for an apology from President Rodrigo Duterte, Evangelist-turned-politician Eddie Villanueva was criticized by a netizen in an open letter, the latter claiming that the president was only being truthful and honest in his statements. Joy Guevara, in is Facebook page said, "I have not read a single incident in the Bible wherein God unleashes his wrath on a person who is being truthful and honest about what they feel and think about God." He said that if there's one thing God would be angry at, it would be hypocrites. "I did read a lot of incidents in the Bible wherein God gets mad at people for misrepresenting Him; for confessing their love and adoration for Him but their actions say otherwise; for being whitewashed tombs; for burdening people with the letter of law but failing to teach the spirit of law; for being presumptuous and proud in thinking that God will spare them of His judgement because they are chosen. In short, for being.... HYPOCRITES." Guevara then proceeded to defend Duterte. "Duterte is not being a hypocrite, bro Eddie Villanueva when he expressed his “stupid God” statement. He was being honest and truthful about questions that bug him about the Bible. The same questions that have also bugged me for quite some time." The netizen then said that the rift between Duterte and the church could have been used as opportunity by the evangelical church. "Bro. Eddie Villanueva, this would have been a golden opportunity for the Evangelical Church to respond with understanding and offer some teachings and perspectives on the question to the Filipino people. However, the recent responses of the Evangelical leaders, you included, practically wasted this opportunity." "I will not mince words here. I express my deep disappointment in the leaders of the Evangelical community. Please go back to your homes and read your Bibles again. You are doing a great disservice to the Gospel," he added. Villanueva, founder of Jesus Is Lord (JIL) Church Worldwide who ran and lost for president in 2004 and 2010, demanded the apology on Thursday. He said that the President, he will organize a protest. “We are representing 10 million people. I don’t believe the President will ignore this. Because once he ignores the collective wisdom of the body of Christ, this may lead to a kind of huge prayer rally that will design first to intercede and to... so-called spiritual warfare,” Villanueva said in an interview with ANC. He called Duterte's words blasphemous. In Duterte's rift with the church, he accused its leaders with sexual abuse, corruption, and attacked the bible, and called the Christian God "stupid". Villanueva called the words, "blasphemous". "To insult God to us is a kind of blasphemy in the highest order. The Bible is clear, when you slander God, you are inviting curses not only to yourself but to the entire nation, like calamities,” the JIL leader warned. “No one can mock God. In Psalm Chapter 2, those who are mocking, persecuting God’s people, the faith of God’s people... God is just laughing at them. They are inviting the wrath of God,” he added. I have not read a single incident in the Bible wherein God unleashes his wrath on a person who is being truthful and honest about what they feel and think about God. I did read a lot of incidents in the Bible wherein God gets mad at people for misrepresenting Him; for confessing their love and adoration for Him but their actions say otherwise; for being whitewashed tombs; for burdening people with the letter of law but failing to teach the spirit of law; for being presumptuous and proud in thinking that God will spare them of His judgement because they are chosen. In short, for being.... HYPOCRITES. Duterte is not being a hypocrite, bro Eddie Villanueva when he expressed his “stupid God” statement. He was being honest and truthful about questions that bug him about the Bible. The same questions that have also bugged me for quite some time. The difference? The man chose to exercise his sacred right to free speech; I did not. It was a question I would rather park for now and ask God himself when the time comes. In both instances, none can be faulted. Bro. Eddie Villanueva, this would have been a golden opportunity for the Evangelical Church to respond with understanding and offer some teachings and perspectives on the question to the Filipino people. However, the recent responses of the Evangelical leaders, you included, practically wasted this opportunity. I will not mince words here. I express my deep disappointment in the leaders of the Evangelical community. Please go back to your homes and read your Bibles again. You are doing a great disservice to the Gospel. That being said, I reiterate my allegiance and commitment to Jesus Christ, whose life, ministry, and teachings offended the religious leaders of His time.